Optional topping of mixed nuts. almonds, walnuts, pecans. manufactured on shared equipment processing tree nuts, milk, soy, wheat/gluten. This nutritional information is for the nut medley topping by itself. 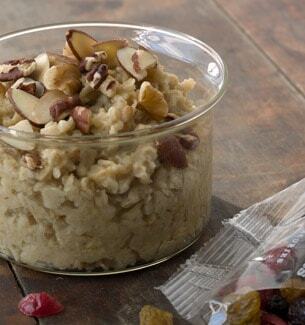 If you'd like to see the nutrition info for Starbucks® Oatmeal, shown with optional Blueberry Toppings or our Starbucks® Oatmeal, shown with optional Classic Toppings, click the appropriate link.